How can I change the submission date? I would like to know how I can edit the submission date, once my form has been completed. The user that fills the form with all the required info, will receive, by mail, both a notification mail and a .pdf file, in which there is the summary of all the information inserted. As first row in the .pdf file, there is the "Submission Date" field. Here, I can see it is wrong, based on my country (I live in Rome, Italy). So, my question is the following. How can I change the time zone in the form settings? 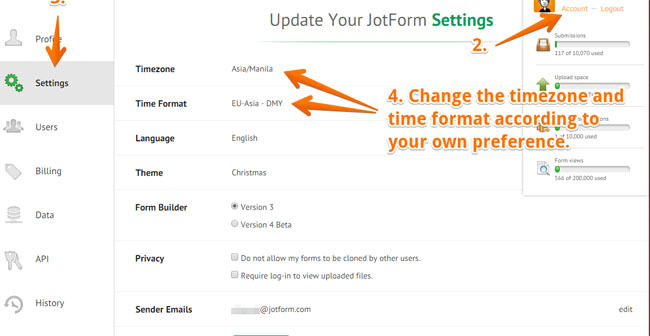 You can do it by login to your JotForm account and then from Accounts->Settings Page, you will see the "Timezone" and "Time Format" option. You can change them from here. After changing them according to your timezone and time format, try submitting your form again. 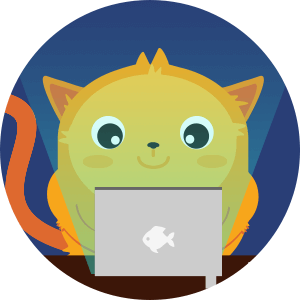 However, the most efficient way is to change your timezone from your account settings. Your account time zone used should reflect in your form submissions time stamp. Note that it may take a while before the changes would take effect.